When the 2014 Chevrolet Silverado and GMC Sierra began reaching dealerships earlier this year, there were two engine options – a 4.3L V6 and a 5.3L V8. Consumers were quick to show that they were much more interested in the V8-powered Silverado and Sierra than the less powerful yet more efficient V6. That early rush put a tremendous load on the 5.3L V8 engine production facility and all of the companies who provide the various components for that engine. Unfortunately, one of those suppliers is unable to keep up with the demand and without this mysterious component, GM is unable to build what they would consider to be an adequate number of 2014 half ton trucks packing this high volume V8. There is a much more powerful 6.2L V8 on the way but with that engine only being available in higher end trimlines so some of those who want a less expensive Chevy or GMC pickup with a V8 engine are left out in the cold. 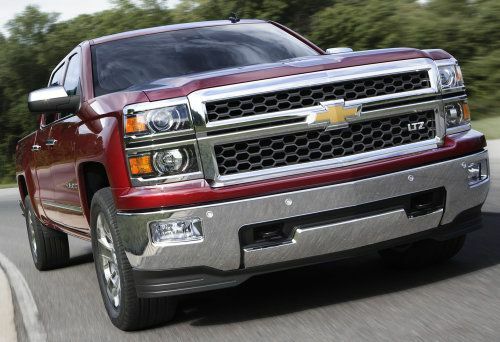 Because of the 5.3L V8 engine shortage, General Motors is restricting the number of 2014 Chevrolet Silverado and GMC Sierra 1500 pickups equipped with that engine that can be ordered by dealerships. According to Bloomberg, dealerships that order 10 of these new trucks may only get 8 of them right now and while the automaker points out that 80% supply rate isn't much of a constraint…it is still a constraint. This means that not only are dealerships incapable of keeping as many trucks on the lot for walk-in traffic to experience but the dealerships may also be unable to fulfill orders for these trucks. This means that buyers willing to wait will be forced to do so for an unspecified amount of time since there has been no timeframe offered as to when this problem will be fixed but worse off – those who are unwilling to wait are more likely to turn to the competitors for their new truck needs. Last month, General Motors full sized truck sales dropped by 8% - a shocking number considering that the company should be riding the big, positive wave of a new model rollout. Typically, a successful new model rollout will account for a big spike in sales but due to a combination of production delays on V8 models and deep discounts from Ford and Ram – GM actually posted a loss just a few months after the launch of these new half ton pickups. You might be wondering how important it is for General Motors to fix this production issue on the new Silverado and Sierra – it is pretty significant. In 2012, General Motors’ truck sales accounted for about 65% of their annual profits so if the slow delivery of 5.3L V8 powered pickups continues as we enter the cooler temperatures that help to improve truck sales, it could have a massive impact on the American automakers’ bottom line for 2013. GM is trying to downplay the severity of this problem but it’s hard to argue with an 8% decline in truck sales just a few months after a pair of new models were introduced.